"The Dear One Letters" are like the breadcrumbs leading us on the path out of the forest to help us find our way Home. They remind us of how life really works and how to feel in control of it. They offer simple yet profound ways of diminishing the fears we have in life, including the fear that we have of being the powerful Light that we are. They lead us step by step, letter by letter, toward loving ourselves more fully and show us a myriad of ways to connect with the Magnificent Light that has been there since the day we were born. Learn more about "The Dear One Letters": Read book excerpts and book reviews. "The Dear One Letters" is available on Amazon, Barnes and Noble and Apple iTunes websites in both paperback and digital versions for Kindle, Nook and iBooks. It can also be purchased directly from this web site for $18 using PayPal (includes shipping and handling). 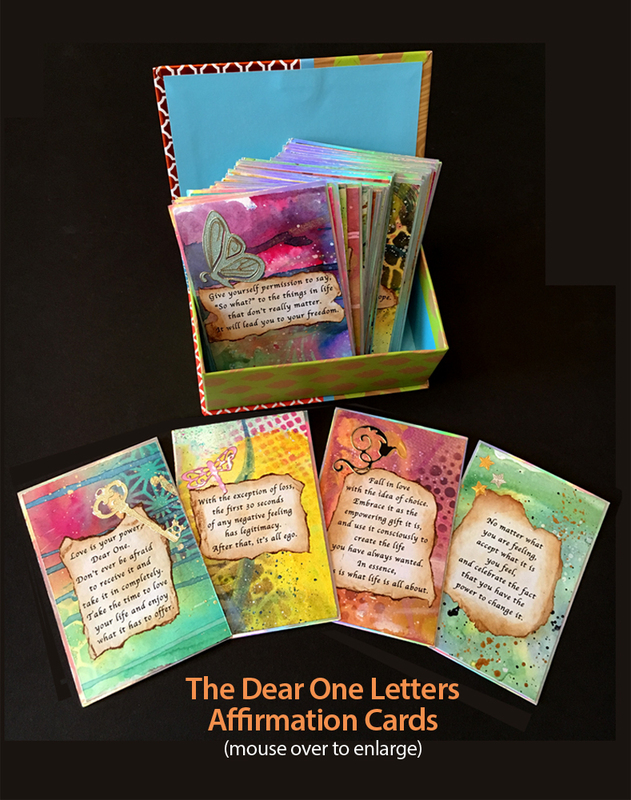 Based on my book, The Dear One Letters, I have created a beautiful 36-card set of quotes from the book that you can draw from and use as affirmations. Each card has a quote on it that you can use as inspiration for the day, for the week, or also as guidance from your soul. One of the ways I’ll use the cards is, I’ll ask the question: "What is it that my Soul wants me to know?" I then shuffle and then stop when it feels right to do so, or I spread all the cards out and pick a card that feels right to choose. And it is so amazing how what I need to hear most comes to me through that card. There are two versions available, the deluxe set and the printed set and both come in a beautiful box. The deluxe set ($125), in which all 36-cards are individually handmade, original works of art. No one else will have the same deck as you in terms of background and embellishments. They sparkle with a 'mirri' border creating a rainbow effect when light reflects off them and the embellishments either "pop out" or sparkle. It takes 9-10 hours to complete one set of 36-cards and they are truly beautiful works of art. The printed version ($45) is a set of laminated printed cards and are reproductions of the original 36-card Master set I created. They have the same words and artwork but without the rainbow sparkles and varying textures but are still just as beautiful as the originals. Both versions are available on this web site via PayPal and includes shipping & handling.